Veritas Technologies has been recognized as a leader in the 2017 Forrester Wave on Data Resiliency Solutions, and is top-ranked among all vendors for the "Strategy" tied to its data resiliency offerings. Veritas, with its 360 Data Management platform for the multi-cloud, delivers highly-scalable enterprise data management solutions that integrate with the broad Veritas portfolio and build on the company’s world-class NetBackup data protection solutions. This approach empowers customers to analyze and protect their data, optimize storage, help ensure compliance and harness the power of their information within traditional on-premises and complex multi-cloud environments. The Forrester Wave on Data Resiliency Solutions evaluates data resiliency software vendors based on their current offering, market presence and strategy in an easy-to-read ‘Wave’ graph with detailed analyses. Complete the form to download your free copy. 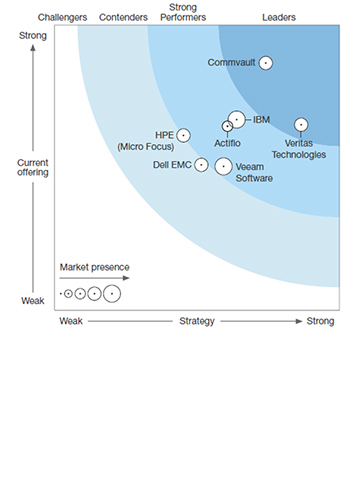 Thank you for your interest in the Forrester Wave on Data Resiliency Solutions report. Please click here to download the file.